If you own or manage a business, it’s essential that you ensure the company’s security system is working at all times. Unfortunately, only one out of every seven businesses invests in some sort of security alarm dispatch system. So if you have integrated alarm systems, you’re already one step ahead of other companies. But it’s not enough to just have an alarm system, you need to have a reliable and effective security system. With that in mind, let’s take a look at a few signs that your security solutions could use some updating. Poor or missing cameras: Security cameras are an important part of every security solution. They can help business owners keep an eye on what’s going on both inside and outside the building. Cameras can also help deter people with bad intentions from stealing anything or trying to break in. But if the cameras are missing or show a poor resolution, they’re not going to be much help. So if your security cameras aren’t living up to their expectations, it’s definitely time for an upgrade. Lack of notifications: One of the best things about modern commercial security solutions is that business owners can be notified immediately if their alarm is set off or if something is amiss. If you have an outdated system, you may not get notified until police arrive at the scene. This is problematic because you should be notified as soon as possible so you can act accordingly. Upgrading your system will allow you to get notifications whenever and wherever so you can be kept in the loop at all times. 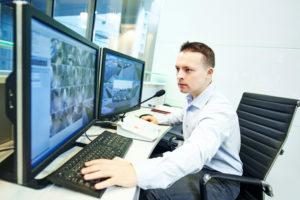 No remote access: Another great thing about today’s security alarm dispatch systems is that business owners can have access to their security footage from wherever they are. Long gone are the days when you had to be in the building looking at the security system to see what’s going on in front of the cameras. Now, you can remotely visit your cameras from a mobile device from anywhere. This means you can have peace of mind knowing your business is secure. If your security system is showing any of these signs, it’s time to upgrade. Having an updated system will allow you to protect your business to the best of your abilities.